An eddy current drive, also known generically as a magnetic drive, eddy current clutch or magnetic clutch, is an electro-mechanical variable speed drive that uses a constant speed motor as the input. The eddy current drive is installed between the motor and the driven equipment. Torque is transmitted to a variable speed output in proportion to a direct current (DC) applied to a set of coils on the output’s rotor. This method of varying speed only reduces the speed of the driven load, which is different than variable frequency drives and DC drives, which vary the speed of both the motor and driven load by electronically altering the input power to motor. Horizontal eddy current drives can either be flange-coupled to the motor or may be separately mounted in a shaft-coupled configuration. In a typical vertical configuration, shown in Image 3, an ordinary induction motor is mounted atop the eddy current drive. The eddy current drive is built within a stationary frame of fabricated or cast steel, with a lower flange and shaft similar to that of a vertical motor. For both configurations, within the frame are two concentric rotating members: the drum, sometimes called the ring, and the output rotor, sometimes referred to as the magnet or field. The drum is a cylinder of magnetically permeable steel coupled directly to the motor shaft, and so rotates at constant speed, determined by the speed of the motor. The variable speed magnetic rotor is mounted concentrically within the drum and is separated by bearings, which maintain an air gap between the inner diameter of the drum and the outer diameter of the magnet to a specified tolerance. The outer surface of the magnet consists of a series of magnetic poles having alternating north and south poles, which are magnetized at varying strength by a low-power DC current, referred to as excitation current. 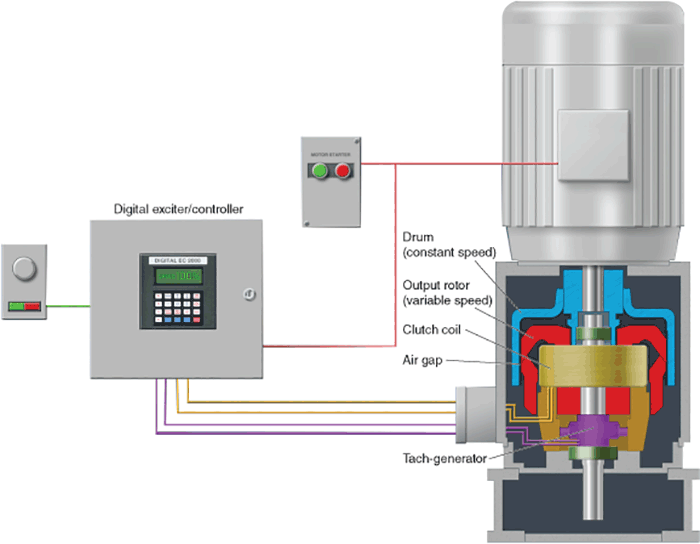 For more information on eddy current drives and other variable speed drives, refer to HI’s Application Guideline for Variable Speed Pumping at www.pumps.org. HI Pump FAQs is produced by the Hydraulic Institute as a service to pump users, contractors, distributors, reps and OEMs. For more information, visit www.pumps.org.